DETROIT-The United Auto Workers, at their 36th Constitutional Convention here on June 5, are ready to fight the greatest assault against working people of our times. Around 2,000 totally fired-up participants would rage out of Cobo Hall and tear their corporate enemies apart, brick by brick, barehanded, if they could. It won’t be easy. Harangues from union leaders do not translate directly through the lower layers of the rank and file. Many shop floor leaders do not want to see change. They were elected by the status quo, and some of them see any kind of change as threatening their positions. The same could actually be said against the top UAW leadership. The Administrative Caucus has triumphed handily in every election since it was set up by Walter Reuther in the late 1940s. Almost every leader at this convention was elected by acclamation. The exception was new President Dennis Williams, the former Financial Secretary. Williams overcame his single challenger 3,215 votes to 49. Nepotism, a natural outgrowth of unchanging leadership, which used to be forbidden in the UAW, is creeping in today. Another problem in the Autoworkers union is persistent anti-communism, which was also established by Walter Reuther and persists today in spite of the AFL-CIO, which ditched anti-communism 17 years ago. 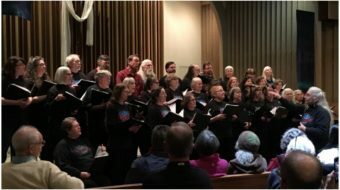 A proposal to scrap the anti-communist article in the UAW constitution did not get enough support to be considered on the convention floor in 2014. The article unfortunately links communists with fascists, so the effort to delete it completely was made more difficult. Although there is no sign of it in the 2014 convention, UAW rank and file members are subject to a certain cynicism. Instead of militant unionism, they are veterans of the UAW’s tepid “Buy American” and “Team Concept” attempts to hang on. UAW members rarely take action without direct orders from above. Almost every move is orchestrated. Even at the convention, many of the speakers from the floor were selected by the ever-present staffers who stand nearby and guard each section of delegates like shepherds guarding their sheep. To prevail, progressive UAW leaders have a lot of inertia to overcome. On the other hand, the convention points out great new positive signs. Discussion was overwhelmingly in favor of embracing immigrants and all other diversity issues. The resolutions “Justice for Immigrant Workers” and, especially, “Forming Lasting Labor and Community Alliances” indicate a broad approach. 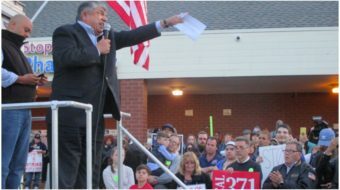 The latter calls for “establishing neighborhood labor-community coalitions that bring together local union members, faith-based organizations, civil rights groups, schools, businesses, young people and others to build enduring partnerships at the local level.” American activists since the days of the Occupy Movement can testify that the UAW is indeed making an effort to bring members out to the streets. 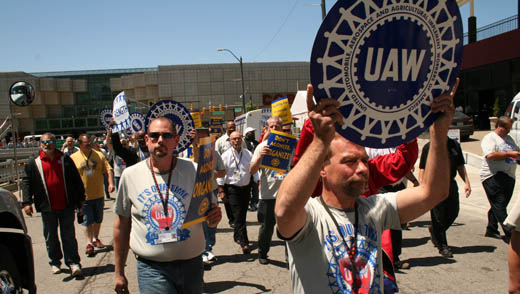 The UAW has developed a habit of including militant pickets and marches whenever they hold national meetings. The 2014 conventioneers stormed out of Cobo Hall to march and rally around the Crowne Plaza hotel at the end of the convention. They were in solidarity with UNITE-HERE workers.